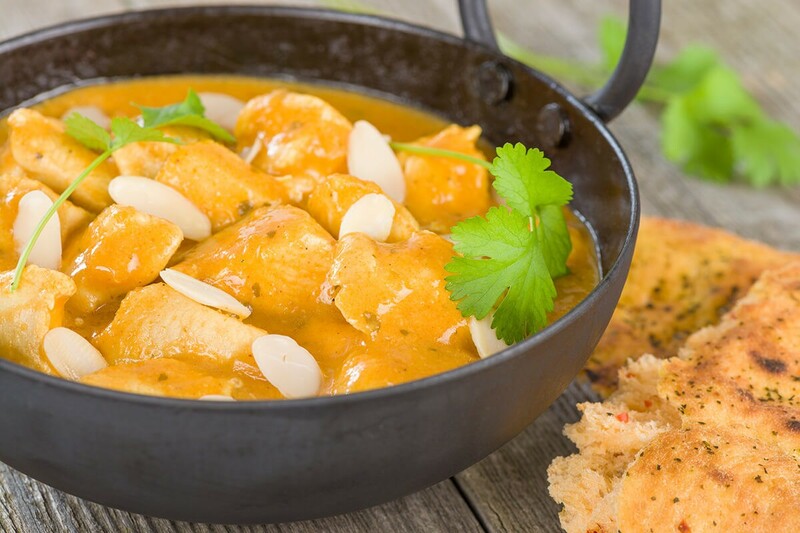 Almond Curry Chicken - Featured on the Martha Stewart Show! Heat oil in a medium ovenproof high-sided skillet. Season chicken with salt and pepper and place chicken, skin-side down, in skillet. Cook until skin is golden brown and crisp, about 5 minutes; turn chicken and cook 2 to 3 minutes more. Transfer chicken to a plate and set aside. Add onions to skillet and reduce heat to medium-low. Cook, stirring occasionally, until soft and beginning to caramelize, about 10 minutes. Stir in curry powder, nutmeg, cinnamon stick, and Almond Dream; season with salt and pepper; bring to a simmer. Return chicken to skillet, skin-side up, and transfer to oven. Cook until chicken is cooked through, about 35 minutes. Remove from oven and season with salt and pepper. Garnish with almonds and cilantro; serve with rice pilaf.